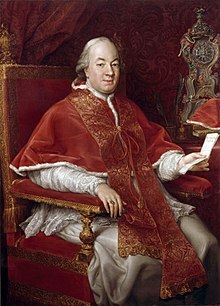 Pope Pius VI (25 December 1717 – 29 August 1799), born Count Giovanni Angelo Braschi, was head of the Catholic Church and ruler of the Papal States from 15 February 1775 to his death in 1799. Pius VI condemned the French Revolution and the suppression of the Gallican Church that resulted from it. French troops commanded by Napoleon Bonaparte defeated the papal troops and occupied the Papal States in 1796. In 1798, upon his refusal to renounce his temporal power, Pius was taken prisoner and transported to France. He died one year later in Valence. His reign of over two decades is the fourth-longest in papal history. Giovanni Angelo Braschi was born in Cesena on Christmas in 1717 as the eldest of eight children to Count Marco Aurelio Tommaso Braschi and Ana Teresa Bandi. His siblings were Felice Silvestro, Giulia Francesca, Cornelio Francesco, Maria Olimpia, Anna Maria Costanza, Giuseppe Luigi and Maria Lucia Margherita. He was baptized in Cesena on the following 27 December and was given the baptismal name of Angelo Onofrio Melchiorre Natale Giovanni Antonio. 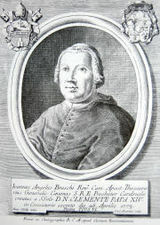 After completing his studies in the Jesuit college of Cesena and receiving his doctorate of both canon and civil law in 1734, Braschi continued his studies at the University of Ferrara. Braschi became the private secretary of papal legate Cardinal Tommaso Ruffo. Bishop of Ostia and Velletri. Cardinal Ruffo took him as his conclavist at the 1740 papal conclave and when the latter became the Dean of the Sacred College of Cardinals in 1740, Braschi was appointed as his auditor, a post he held until 1753. His skill in the conduct of a mission to the court of Naples won him the esteem of Pope Benedict XIV. In 1753, following the death of Cardinal Ruffo, Benedict appointed Braschi one of his secretaries. In 1755, the pope appointed him as a canon of St Peter's Basilica in 1755. In 1758, putting an end to an engagement to be married, he was ordained to the priesthood. Braschi was also appointed as the Referendary of the Apostolic Signatura in 1758 and held that position until 1759. He also became the auditor and secretary of Cardinal Carlo Rezzonico, the nephew of Pope Clement XIII. In 1766, he was appointed as the treasurer of the camera apostolica by Pope Clement XIII. Those who suffered under his conscientious economics had managed to convince Pope Clement XIV to elevate him into the cardinalate. Braschi was elevated on 26 April 1773 in Rome as the Cardinal-Priest of Sant'Onofrio. This was a promotion which rendered him innocuous for a brief period of time. He then retired to the Abbey of Subiaco, of which he was commendatory abbot. Pope Clement XIV died in 1774 and this triggered a conclave to choose a successor. Spain, France and Portugal dropped all objections to the election of Braschi, who was one of the more moderate opponents of the anti-Jesuit stance of the late pope. 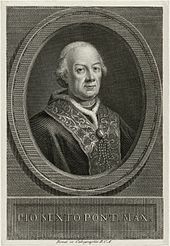 Braschi received support from those who disliked the Jesuits and were of the belief he would continue the actions of Clement XIV and hold true to Clement's brief "Dominus ac Redemptor" (1773) which saw the dissolution of the order. But the zelanti faction - pro-Jesuit - believed that he was in secret sympathetic towards the Jesuits and expected reparation for the wrongs suffered in the previous reign. As a result, Braschi - as pope - was led into situations where he gave little satisfaction to either side. Cardinal Braschi was elected to the pontificate on 15 February 1775 and took the pontifical name of "Pius VI". He was consecrated into the episcopate on 22 February 1775 by Cardinal Gian Francesco Albani and was crowned that same day by the Cardinal Protodeacon Alessandro Albani. Pius VI elevated Romualdo Braschi-Onesti as the penultimate cardinal-nephew. Pius VI first opened a jubilee his predecessor convoked and it initiated the 1775 Jubilee Year. The earlier acts of Pius VI gave fair promise of reformist rule and tackled the problem of corruption in the Papal States. Though he was usually benevolent, Pius VI sometimes showed discrimination. He appointed his uncle Giovanni Carlo Bandi as Bishop of Imola in 1752, and then as a member of the Roman Curia, cardinal in the consistory on 29 May 1775, but did not proffer any other members of his family. He reprimanded prince Potenziani, the governor of Rome, for failing to adequately deal with corruption in the city, appointed a council of cardinals to remedy the state of the finances and relieve the pressure of imposts, called to account Nicolò Bischi for the spending of funds intended for the purchase of grain, reduced the annual disbursements by denying pensions to many prominent people, and adopted a reward system to encourage agriculture. Upon his election, Pius VI ordered the release of Lorenzo Ricci, Superior General of the Society of Jesus, who was held prisoner in the Castel Sant'Angelo, but the general died before the decree of liberation arrived. It is perhaps due to Pius VI, that the Jesuits managed to escape dissolution in White Ruthenia and Silesia. In 1792, the pope considered the universal re-establishment of the Society of Jesus as a bulwark against the ideas of the French Revolution, but this did not happen. Besides facing dissatisfaction with this temporising policy, Pius VI met with practical protests tending to the limitation of papal authority. Johann Nikolaus von Hontheim, writing under the pseudonym of "Febronius", the chief German literary exponent of Gallican ideas of national Catholic Churches, was himself induced (not without scandal) publicly to retract his positions; but they were adopted in Austria nevertheless. There the social and ecclesiastical reforms which had been undertaken by Emperor Joseph II and his minister Kaunitz, as a way of influencing appointments within the Roman Catholic hierarchy, touched the supremacy of Rome so nearly that in the hope of staying them Pius VI adopted the exceptional course of visiting Vienna in person. He left Rome on 27 February 1782 and, though magnificently received by the Emperor, his mission proved a fiasco; he was, however, able a few years later to curb those German archbishops who, in 1786 at the Congress of Ems, had shown a tendency towards independence. In the Kingdom of Naples difficulties necessitating certain concessions in respect of feudal homage were raised by the liberal minister Tanucci, and more serious disagreements arose with Leopold II, later emperor, and Scipione de' Ricci, bishop of Pistoia and Prato, upon the questions of reform in Tuscany. The papal bull Auctorem fidei issued on 28 August, 1794, is a condemnation of the Gallican and Jansenist acts and tendencies of the Synod of Pistoia (1786). On August 17, 1775, Pope Pius VI promulgated with a Papal Decree the authenticity of Our Lady of Šiluva. Pius VI saw the development of Roman Catholicism in the United States of America. He released the American clergy from the jurisdiction of the Vicar Apostolic in England, and erected the first American episcopal see, the Diocese of Baltimore in November of 1789. Pius VI elevated 73 cardinals in 23 consistories. He canonized no saints but he beatified a total of 39 individuals that included Lawrence of Brindisi and Amato Ronconi. The pope also set the Pontifical States' finances on much steadier ground. Pius is best remembered in connection with the expansion of the Pio-Clementine Museum, which was begun at the suggestion of his predecessor Clement XIV; and with an attempt to drain the Pontine Marshes, but Pius VI did successfully drain the marshes near Citta della Pieve, Perugia, and Spoleto. He also restored the Via Appia. Pius VI also deepened and expanded the harbors of Terracina and Porto d'Anizo, a major center of Pontifical trade. Pius was a great patron of the arts and humanities; he also added a new sacristy to St. Peter's Basilica. At the outbreak of the French Revolution in 1789, Pius VI witnessed the suppression of the old Gallican Church as well as the confiscation of pontifical and ecclesiastical possessions in France. It also saw an effigy of himself burnt by the Parisians at the Palais Royal. He saw the events as a sign of opposition against the social order ordained by God and also viewed it as a conspiracy against the church. The pope condemned both the Declaration of the Rights of Man and the Civil Constitution of the Clergy and supported a league against the revolution. He issued two briefs - "Quod aliquantum" (1791) and "Caritas" (1791) - to condemn the ecclesiastical reforms that were proposed. 1791 marked the end of diplomatic relations with France and the papal nuncio, Antonio Dugnani, was recalled to Rome as a result. One of the reasons for the breach was the seizure by the revolutionaries of the Comtat Venaissin, ending 516 years of Papal rule in Avignon. King Louis XVI of France was executed via guillotine on 21 January 1793, and his daughter Marie Thérèse petitioned Rome for the canonization of her father. Pius VI hailed the late king as a martyr on 17 June 1793 in a meeting with cardinals, giving hope to a potential possibility of sainthood. In 1820, two decades following the death of Pius VI, the Congregation of Rites put an end to the possible sainthood since it was impossible to prove the king died for religious reasons rather than political ones. Pius VI argued that the main thrust of the revolution was against the Catholic religion and Louis XVI himself. In 1796 French Republican troops under the command of Napoleon Bonaparte invaded Italy and defeated the papal troops. The French occupied Ancona and Loreto. Pius VI sued for peace which was granted at Tolentino on 19 February 1797; but on 28 December 1797, in a riot blamed by papal forces on some Italian and French revolutionists, the popular brigadier-general Mathurin-Léonard Duphot, who had gone to Rome with Joseph Bonaparte as part of the French embassy, was killed and a new pretext was furnished for invasion. General Berthier marched to Rome, entered it unopposed on 10 February 1798, and, proclaiming a Roman Republic, demanded of the pope the renunciation of his temporal authority. Upon his refusal, Pius was taken prisoner, and on 20 February was escorted from the Vatican to Siena, and thence to the Certosa near Florence. The French declaration of war against Tuscany led to his removal (he was escorted by the Spaniard Pedro Gómez Labrador, Marquis of Labrador) by way of Parma, Piacenza, Turin and Grenoble to the citadel of Valence, the chief town of Drôme where he died six weeks after his arrival, on 29 August 1799, having then reigned longer than any pope. Pius VI's body was embalmed, but was not buried until 30 January 1800 after Napoleon saw political advantage to burying the deceased Pope in efforts to bring the Catholic Church back into France. His entourage insisted for some time that his last wishes were to be buried in Rome, then behind the Austrian lines. They also prevented a Constitutional bishop from presiding at the burial, as the laws of France then required, so no burial service was held. This return of the investiture conflict was settled by the Concordat of 1801. Pius VI's body was removed from Valence on 24 December 1801 and buried at Rome 19 February 1802, when Pius VI was given a Catholic funeral, attended by Pope Pius VII, his successor. "The mortal remains of Pius VI, consumed in unjust exile, by order of Pius XII are placed in this dignified and decorous location, illustrious for art and history, in 1949". A long audience with Pius VI is one of the most extensive scenes in the Marquis de Sade's narrative Juliette, published in 1798. Juliette shows off her learning to the Pope (whom she most often addresses as "Braschi") with a verbal catalogue of alleged immoralities committed by his predecessors. ^ "The Wind was too Strong". Rome Art Lover. Retrieved 12 February 2014. ^ Eamon Duffy, Saints & Sinners: A History of the Popes, (Yale University Press, 2001), 254. ^ a b c Miranda, Salvador. "BRASCHI, Giovanni Angelo (1717-1799)". Cardinals of the Holy Roman Church. Retrieved 14 April 2015. ^ a b Eamon Duffy, Saints & Sinners: A History of the Popes, 251. ^ McBrien, Richard P. (1997). Lives of the Popes: The Pontiffs from St. Peter to Benedict XVI. San Francisco: HarperCollins. p. 328. ISBN 978-0060653033. ^ "Braschi, Giovanni Angelo (1717-1799)". Cardinals of the Holy Roman Church. Retrieved 14 April 2015. ^ "Pius VI: Quare Lacrymae". 29 January 2015. Retrieved 20 April 2015. 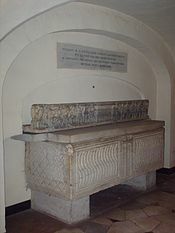 ^ "Tomb of Pope Pius VI". This article incorporates text from a publication now in the public domain: Herbermann, Charles, ed. (1913). "Pope Pius VI". Catholic Encyclopedia. New York: Robert Appleton. This article incorporates text from a publication now in the public domain: Chisholm, Hugh, ed. (1911). "Pius" . Encyclopædia Britannica (11th ed.). Cambridge University Press. Ludwig von Pastor, 1952. The History of the Popes from the close of the Middle Ages, (St. Louis : Herder) vols. XXXIX and XL. Donat Sampson, "Pius VI and the French Revolution,” The American Catholic Quarterly Review 31, January – October, 1906; Part II, Ibid., p. 413; Part III, p. 601; Part IV and Ibid., Vol. 32, N°. 125, p. 94, January 1907; Part V, Ibid., p. 313. Wikimedia Commons has media related to Pius VI.